One chair was not stained on a part so have to return. They needed wooden covers for screw holes and it would look way better. Few pieces could have been sanded a little more. Develop your home's personality using the warmth of wood and the influence of yesteryear with this International Caravan rocking chair. With its simple lines, beautiful woodgrain and slatted back and seat that hint at Mission-style design, this chair delivers style that imbues your home with a sense of grace. Place this chair on a porch where you can gently rock while admiring garden blooms and appreciating the fresh, cool breeze. Drape a fringed throw over the back of the chair, ready to provide warmth on chilly evenings. Set up the rocker in the nursery to soothe, comfort and lull your precious baby to sleep with a peaceful rocking motion. Dimensions 6.0 In. X 23.0 In. X 46.0 In. I ordered two of the rocking chairs for my deck . They're very nice looking, big and heavy - there's nothing skimpy about them. The assembly was relatively easy. The only "but", and it's a big one, is that they're just not real comfortable. You probably won't want to sit and rock for hours. The back of the chair curves in the wrong place, not just for me but my friends and family have said the same thing. I've bought cushions for the seats which might help by changing where my back hits the chair... And they look so good we decided to keep them and use them as extra seating. We love our rocking chairs on the front porch. The seats are very wide, giving anyone that sits down plenty of room to feel comfortable. The backs are high and arched like they were made specifically for your bodies comfort. I would recommend this product to my friends and family for the quality and price. The chair is very nice. Strong and heavy wood, but the instructions were not very clear. I thought the screws that came with the chair were too short, but my teenage son figured out how the end piece on the screw fit into the chair so that the screws were long enough. If it had not been for him, I would have given up putting the chair together. I would have given the chair five stars if it had not been for the instructions. Other than that, the chair is beautiful and just what I wanted. Item was well packaged. Since I am pretty good at assembling things, I looked forward to assembly this chair from the moment I received it. The diagram was a few pictures with no words of instruction, but the chair came together easy with the exception of the back part portion which I had to examine the diagram photo closely and still was not sure if I had it on together correctly. After hit and miss with the back part of the the chair, it game together ready for the final personal test of sitting and rocking. It is a very solid chair and I like the color of the wood. My girlfriend complained that it did not rock back far enough. It did feel like it had a flat spot when rocking it, but overall I am happy with the chair and recommend it to others who want a nice solid rocking chair. If you've ever yearned to hone your carpentry skills, order a couple of these gems and your set. First you'll probably notice a couple of minor split pieces. If you've got some good waterproof wood glue, get it out and put them back in place. If not, go get some, you'll want it for the rest of the job. While you're there, get a wood chisel if you don't own one-now's a good time to learn, right? Once they're out of the box, you'll notice that it's actually pretty decent wood, and is better than your typical furniture in a box. Assembly starts with using three small screws to attach the back brace to the seat. Don't tighten the screws all the way yet. Add some wood glue along the joint. that joint will hold a lot longer. Now you line up the back and seat and put them on a side rail. Again, glue in the joints is your friend. These are not panels you want to have some give, these need to be solid. Before you add the glue though, test fit the joints. I had one tenon cut to long, and one too narrow. Luckily I do own a wood chisel and a couple of taps later, all was well. Now that it's test fit and ready, take the panels loose, add glue to the joints, put them back together, and use the toggle type bolts to snug them up. Now repeat for the other side frame. Now add the rockers. Again, test first, trim if needed, then glue and screw. These are a little fussy to do-if you can get it to counter height, laying on its side, with the rocker you're attaching on the bottom side, hanging over the edge, it'll go pretty quickly. Have a narrow magnet ready too, in case you have to fish one of the "nuts" out of the hole. Now you're done...unless you want to use it outside, then you've got to decide. Polyurethane, Spar Varnish, or just let it weather? All in all, it wasn't that tough to do, and they do feel fairly solid. As noted by a couple of other reviewers 1-they aren't that comfortable-buy cushions 2-they're good sized. The weight limit is 275, and that's about the biggest person who will be comfortable in them. 3-If they'd put some darn PLUGS in there to fill in the holes left by the screws, it would improve the quality 500 percent. Seriously, this thing is three dollars (plugs and a bottle of glue) away from being a great product. This rocking chair is fabulous! I wanted something for my front porch so I could read comfortably while I watch the New Mexico clouds pass overhead. The chair is beautiful, sturdy, and comfortable. One slight problem -- after I put a nice, thick cushion on the seat my feet didn't touch the ground (important for rocking!!) -- I'm only 5'4". A cute little 10" high wooden footstool from Michael's, finished to match the chair, is the perfect solution. I highly recommend this rocking chair. I love this chair. I have had it now for 6 years and it is beautiful and strong. A large rocking chair. 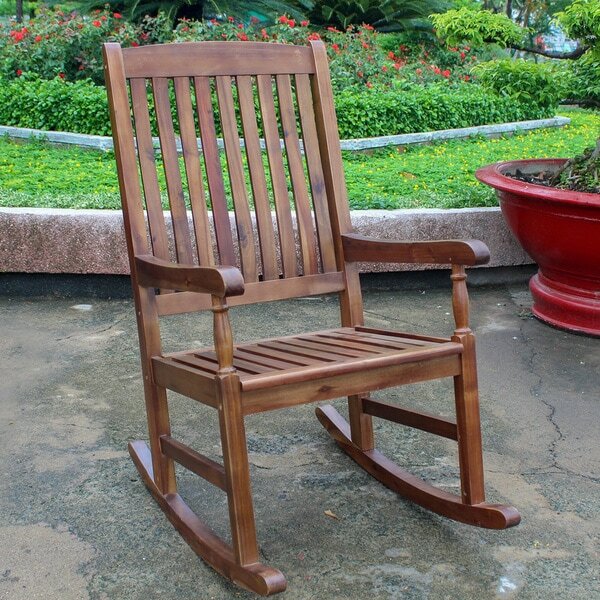 This rocking chair was simple to put together and I was very excited to find the quality of the woodwork reviles more expensive rocking chairs. I put it together quickly and have been enjoying the back deck so much more now that I can sit and rock away! The rocker looks better than the picture. The quality is wonderful, the finish is nice and smooth to touch. It is a large rocker, like "Papa Bear" size. I bought this idenitcal rocker at a club member store a few years ago. It's withstood the test of time & seasons beautifully. I love this rocker so much I bought 2 more from Overstock.com. It is easy to assemble and is very sturdy. I reccomend applying a wood seal if used outside. I just received two patio rockers and I simply love them. They look exactly as pictured on the website and were very easy to assemble. I was impressed with the weight and durability of the rockers as well. I highly recommend this product. Overstock.com, thusfar, is 2 for 2 in quality satisfaction in our house. Last year's Gazebo was a big hit and now these rockers are a wonderful addition to our "outdoor room." Thanks Overstock! I bought two of these rockers and am totally pleased with them. The weight is not flimsy, the assembly was easy (once I got used to the nut and bolt usage!) I didn't have any issues with alignment of the holes. It took a little less than an hour to put together (by myself!). I like the color of the oil finish. I find them to be comfortable without a cushion, but adding a cushion would be great if you plan to spend the afternoon rocking on the porch! I would recommend these to anyone - I don't think you can beat the price! Bought this rocking chair for hubby, who teaches 3-5 year olds with disabilities, for his classroom chair as he has back issues and the teeny student chairs were not made for him. He's not a tiny guy - over 6 feet, broad-shouldered... and he loves it! His only problem is keeping the kiddies out of it because they love it, too!Beautiful wood, well-planned for assembly (he does some woodworking and has built some furniture, so he knows if it's good or not :), and we plan to buy two more when our new house is finished - for the front porch! My husband quickly put these together, they look great and are extremely comfortable. They seem to be very sturdy. I was very surprised at the high quality of these chairs, They are heavy and strong. Very comfortable, and they look great. I took a chance and bought 2. They took about 20 minutes to put together with no issues. excellent purchase. Everything everyone says about the assembly is true--you will need a drill (and a heavy mallet helps), and you will be frustrated. Half way through the first chair I was ready to call them kindling. I finally got the first one together and it is sturdy and comfortable and I like the way it looks. The only criticism I have for the finished product is the feel of the rocking--I think the rockers are too short and/or not smooth enough. The chair itself is comfortable to sit in, but rocking feels awkward and bumpy. Anyway, these were inexpensive and look great on my front porch, so I would recommend them as long as you are good with tools and have patience for putting furniture together. Received this rocking chair with 2 right sides. Called Overstock and was pleased that they would send me the left side without having to send back the entire chair. Received the second shipment only to find out it was the right side again. I now have a rocking chair with 3 right sides. I have placed another call to Overstock requesting the LEFT side again! Let's hope the 3rd time is a charm. If I receive another right side I am going to be livid and request a whole new chair!!! The chairs are great, but one came damaged. This is our second order from Overstock to arrive damaged and will most likely be our last. Love love my new chairs. would recommend them to anyone. they are very comfortable and look great on my porch. Excellent quality and color. Very comfortable, sturdy chairs . Love love love!! Bought these chairs for my parents front porch, and they are obsessed with them!! I ended up purchasing the matching table too and they all look great!! Poor quality to be outside! Great chair! I bough two...good for the price and easy to put together. I’ve had them 4 years and they’ve held up well. "how difficult is it to assemble? i'm a 72 yr old woman, not in the best of health and no access to anyone stronger. do you think i'll be able to assemble this chair? thank you , Sherry"
We got the chair as a gift for my son. They love it, it is very strudy and durable. My husband put it together and is very piticular, and good at these kinds of projects, he had to improvise and use gorilla glue but because he is good he was able to make it work. I probably would of had problems, but maybe some of the chairs are better than the one we got? I would buy again. "how much weight will it hold ?" There is no published recommended weight but it is a very sturdy and wide chair. I do not know how weight it can take, but the weightiest person in our family is 230 lbs and I am sure that it can take more than that. "What color is the stain for these chairs? " Our chairs are close to a pecan color. "Which Cushion can I Order for this Rocking Chair? Which one fits?" "Hi: Should I put a clear sealer paint on these rockers to protect them from the weather?" You could - putting a clear sealer on any wood product is always a good idea. Call it preventative maintenance - I'll just call it smart! "A customer posted a 1 star rating in August said the chair had defects. I see that all sales are final. Is it returnable if there are defects?" Hello shannon2811, yes this is definitely returnable if it is defective. Have a great day and thank you for shopping with us! I like the looks of it and I needed brown to go with the color of my house. It looks nice; and MOST of the reviews were positive. This product is not yet released, and is expected to ship on Sep. 28, 2005.